At first glance, jellyfish appear to be simple creatures. They don’t have eyes, or hearts, or even a brain. Most species simply drift in the open ocean, going wherever the current takes them. But there’s a lot more to jellies than meets the eye. They’ve been around for at least 600 million years, making them some of the oldest creatures on the planet. They thrive in every ocean and from pole to pole. They have also adapted to live at nearly every depth in the ocean, from topside, wind-surfing species like Velella velella to bioluminescent deep sea dwellers. For such ancient creatures, jellies are relatively new to science. Compared to other sea creatures, little research has been done about jellies. For instance, the beautifully colored Flower Hat Jellyfish was first described about 100 years ago. But until recently, little was known about where Flower Hats live in the water column or how they reproduce. Found off the coasts of Japan and Argentina, Flower Hat jellies are small in size, just six inches across, and glow an iridescent green under blue light. Unlike many other jellies, Flower Hats prey on small fish. The species was recently on display at “The Jellies Experience” exhibit at Monterey Bay Aquarium. Flower Hat Jellies are notoriously difficult to breed in captivity, partially because of a quirky behavior. To simulate their natural environment, Patry and his team installed a small grate in a tank of Flower Hats enclosure for the jellies to rest on.The grate prevented them from resting on the bottom of the tank, where bacteria and leftover fish collected. After installing the grate, Patry and his team made a discovery about the Flower Hats’ life cycle. 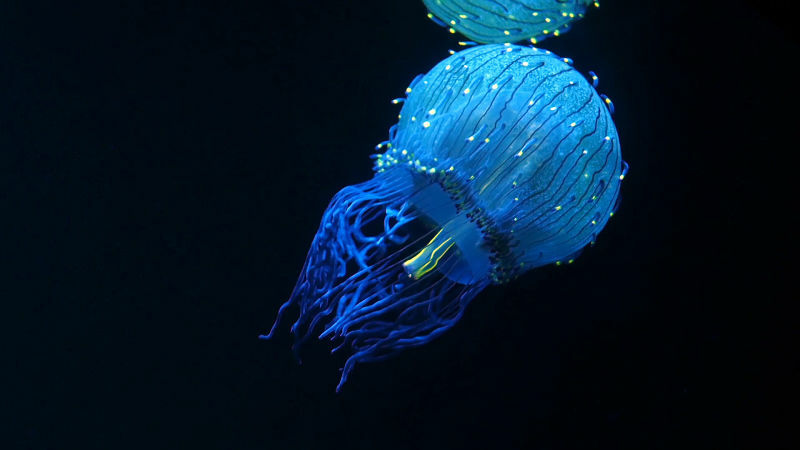 Under the blue light that makes the jellies glow, Patry discovered Flower Hat jellyfish in their early stages of life. Both the babies and juveniles, called polyps and medusa, turn a bright fluorescent green under blue lighting - just like the adults. For the first time, Patry was able to see and describe the life cycle of Flower Hat jellyfish. He hopes these new insights will help lead to more discoveries on how jellyfish bloom in the wild. Blooms occur when jellies reproduce en masse. The have caused worldwide disruptions to the fishing industry and nuclear power plants who use seawater to cool their reactors. Massive blooms of jellies with powerful stings have also posed a threat to beach goers and swimmers. Jellyfish sting and paralyze their prey using special cells called nematocysts. 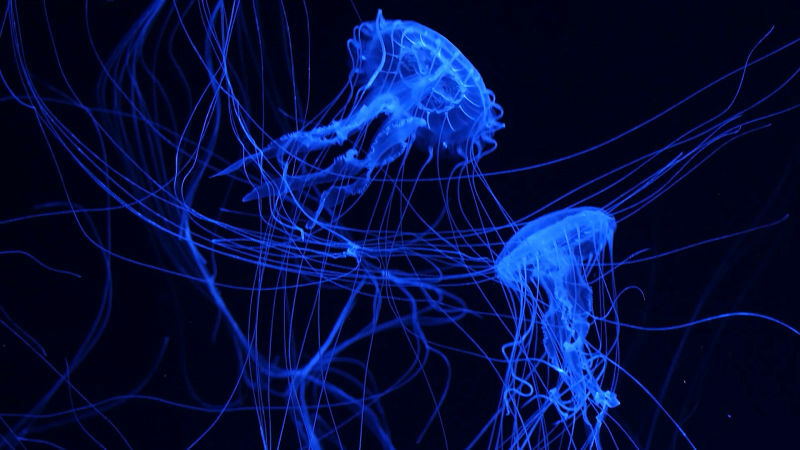 Jellyfish don’t have a brain or a central nervous system to control these stinging cells, so each one has it’s own trip wire, called a cnidocil. The long tentacles that stream behind many jellyfish are lined with billions of specialized stinging cells called nematocysts. The nematocyst only works if the barb can penetrate the skin, which is why some jellies are more dangerous to humans than others. The smooth-looking tentacles of a sea anemone (a close relative of jellies that also has nematocyst cells) feel like sandpaper to the touch. Their nematocysts are firing, but the barbs aren’t powerful enough to puncture your skin. The sting of the Flower Hat Jellyfish, on the other hand, can be very painful, according to Patry, who gets stung several times a year. Unlike more specialized species, jellies can tolerate a wide range of ocean conditions. They can reproduce en masse when conditions are good, but are flexible enough to outlast other species when the ocean environment changes. Jellyfish are the ultimate survivors. They’ve survived five mass extinctions and are some of the most common predators in the ocean. And if their history is any indication, jellyfish may outlive us as well.